Published on June 13, 2015 in Elections, General T&T, Media, Opposition Party, Parliament, People's Partnership, PNM, Politics and UNC. 19 Comments Tags: Kamla Persad-Bissessar, Keith Rowley, Newsday, Patrick Manning, Politics, T&T Govt. 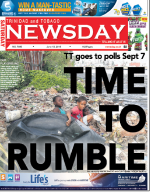 PRIME MINISTER Kamla Persad-Bissessar, 63, yesterday announced the date of the general election as September 7. In a statement at the House of Representatives, the Prime Minister informed the nation that she would advise President Anthony Carmona, “to dissolve Parliament at midnight on Wednesday 17th June, 2015” – a move which will bring to an end the Tenth Parliament and clear the way for the Eleventh. In announcing the date of the election, Persad-Bissessar said her Government was the first under the Republican Constitution to serve its full term. She said it did so despite the expectations of the Opposition.